A decadent liquid dessert constructed of fresh Raspberries, warm chocolate and liquoricey treacle that fills your nose with warm, sticky comforting flavours. The palate goes deeper and more complex with a heady hit of sweet raspberry tartness, bitter dark Javan chocolate burnt vanilla and nutty caramel notes that lead to a long lingering finish of bitter fresh vanilla pods, raspberries and a dusting of cocoa. Pure gluttony. SAFETY NOTICE: Does not contain actual heavy water. Fuelled by pure mango petrol this juicy double Ipa is a banger. A sneaky but well meaning bitterness luring in the background, with a pleasant fruity sweetness being the main star on stage. Limited stock: 2 cans max per customer. A collaboration between Dutch brewers, De Molen and Beavertown brings a very special Farmhouse Ale. This Gin & Tonic inspired beer is seasoned with juniper berries, coriander seeds, lemon peel and the bitter cinchona bark to create the craft beer version of a good old Gin Tonic. A double version of Beavertown’s first ever beer, “Neck Oil,” brewed to celebrate their Fourth Birthday, everybody who has helped over the years and all those around who make great beer! Resinous and hoppy, but oh so dangerously drinkable. You will have cake coming out of your eyes. The change in the size of the crowd at the Beavertown Brewery Taproom, from the 2016 Bloody ‘Ell Blood Orange IPA launch to the 2017 crop is a metaphor for the growth of the whole London craft beer scene itself. And by that, I mean explosive. IBC was at the event last year, where a few die-hards had shown up to try the seasonal IPA. However, this year, everyone and his dog had packed into Lockwood Industrial Park to see the new brew. Fortunately, it didn’t disappoint. Bloody ‘Ell – that’s a nice beer. Tangy, hoppy and dangerously drinkable because it hides the high alcohol percentage (7.2%) in such a way that the Blood Orange IPA could easily be a session ale. It’s a real summer ale – and it’s as if the chaps at the Beavertown Brewery Taproom had told the weather as much. 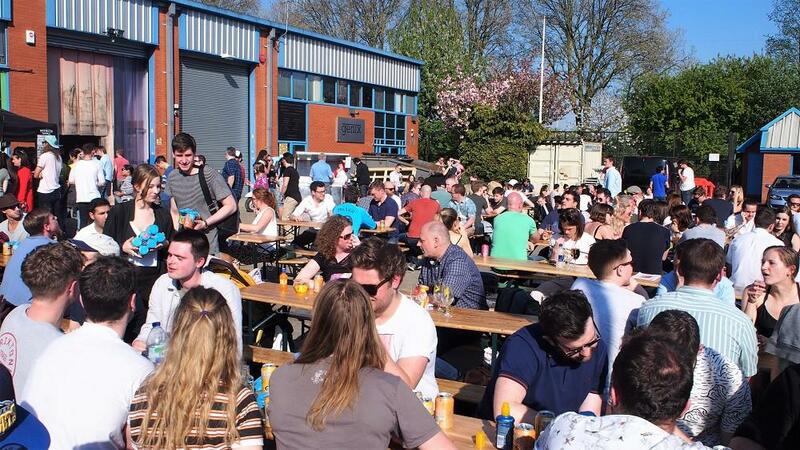 The sun shone brightly over Tottenham Hale as the taproom and can bar doled out numerous drinks to a full house – it’s the closest I’ve ever felt to being at a music festival in a retail park. Where else can I buy the 2017 Bloody ‘Ell Blood Orange IPA? Hunter and Sons, Bath; Bundobust, Leeds; clinkbeer, Birmingham; Dead Crafty Beer Company, Liverpool; Small Bar, Bristol; Ply, Manchester; Salt Horse, Edinburgh; House of Trembling Madness, York; The Free Trade Inn, Newcastle; Hippo Taproom, Glasgow; and Dukes Que and Brew, London. 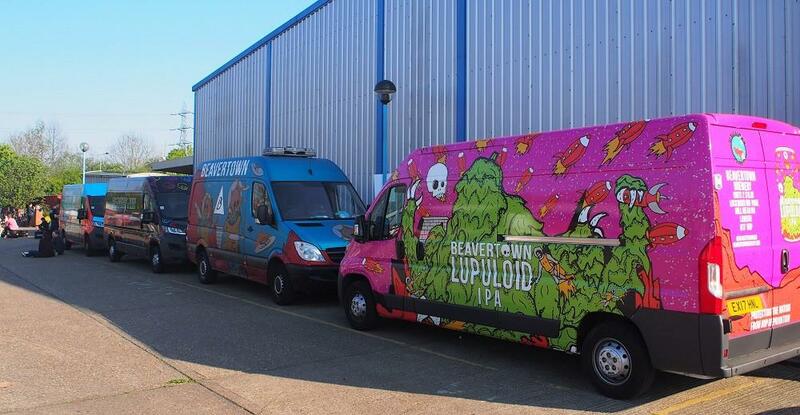 To learn more about how to get to the Taproom and what to expect on a regular (non-launch) day at the Beavertown Brewery, see our article. Brewed in collaboration with Brouwerij Alvinne. The nose is complex with cloves and sweet candy like notes mixing with earthy, floral and wine like characteristics. The flavour is deep leading with classic triple flavours of sweet-malt, figs and a touch of honey. The finish is peppery with some fruit courtesy of the wine barrels. The are some funky notes hanging out in the background with a small gang of candied orange tones. The mouthfeel is round and warming. 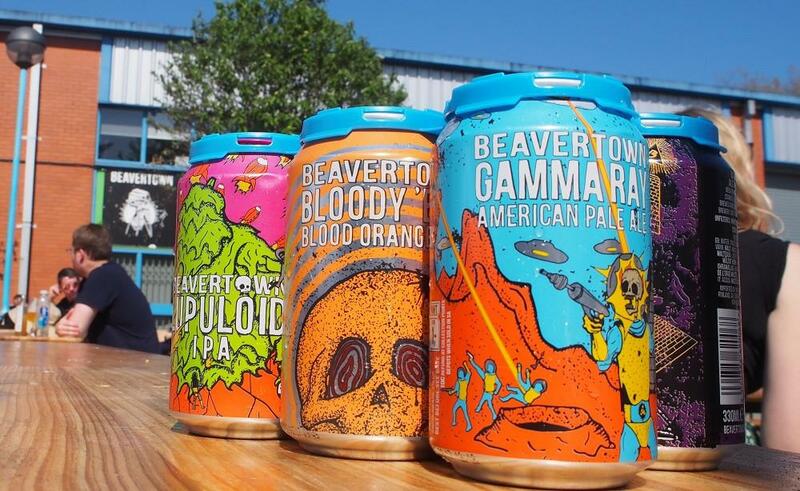 If there’s one thing Beavertown Brewery know how to do, it’s brew beer – and there’s no better place to sample it than by visiting their excellent taproom on a Saturday afternoon. It’s worth keeping an eye on their website for events. Most recently, we attended the 2017 launch of the Bloody ‘Ell Blood Orange IPA which was like a mini-festival with a few hundred craft beer lovers in attendance. Which beers are on offer? Of course, the Beavertown taproom itself (offering 1/2 pint or 2/3 pint measures), gives you the chance to try some interesting brews you might not encounter elsewhere. On our most recent visit they were serving Beavertown Says Max Das Intern Bavarian Pilsner (ABV: 4.5%) and Beavertown Brewery’s collab with Square Root Ldn, Bergamonster Hefeweiss (ABV: 5.63%). But of course we couldn’t miss the Beavertown-Brewdog collaboration Coffee & Cigarettes (ABV 12.1%) which completely lived up to its name – it was like a French breakfast in a can. There’s also a great selection of snacks and street food on offer. Depending on the day, expect to see food and / or nibbles from the likes of Boxty’s (Irish street food), Karkli (lentil snacks), Soffles (pitta chips) and Woza (biltong). There’s also a strong display of Beavertown Brewery merchandise, including t-shirts, hoodies, beanie hats, glasses and fabric patches, all available to buy. It’s surprisingly easy to get to the taproom from central London, thanks to the usually reliable Victoria Line, which stops at Tottenham Hale. From there, walk east down Ferry Lane, passing the enormous, vibrantly coloured, student accommodation and cut through Hale Village to get to Mill Mead Road. You can also take national rail services from Liverpool St to Tottenham Hale. 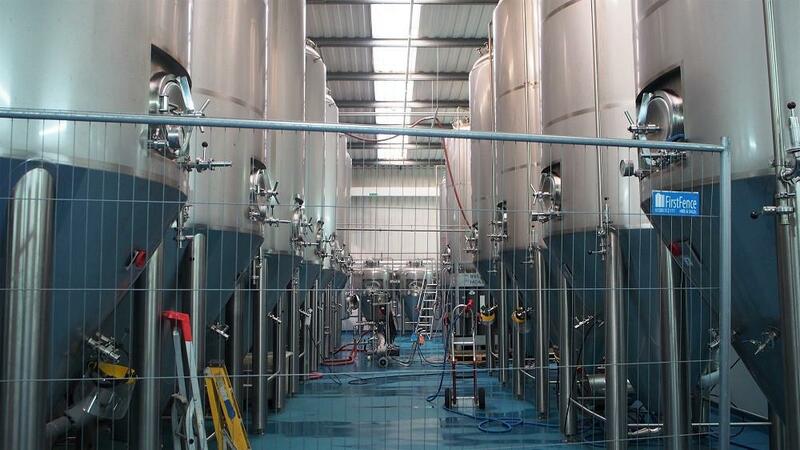 When are the Beavertown Brewery Taproom events? The brewery taproom is open most Saturdays, 2pm – 8pm, even when there isn’t a special event or beer launch. Visit the Events section of the Beavertown Brewery website to stay up to date or follow them on Twitter, Facebook or Instagram.